This recipe is straightforward & foolproof. Although, you may want to visit your local Vietnamese supermarket for maximum results. Particularly for the carrot & daikon slaw, which is a staple, but also for the magi sauce, pork belly, and generally good deals to be found there. 1. Finely chop green onion; dice garlic & chili. 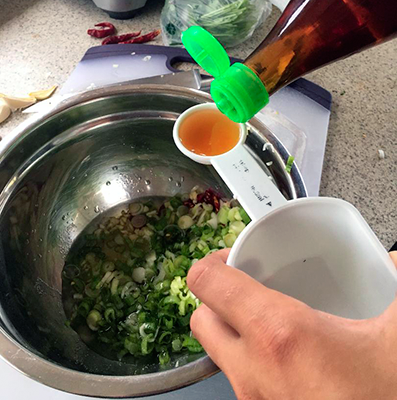 2, Combine onion, garlic, chili, fish sauce, coconut water, sugar, and pepper in a bowl. Mix well. 3. 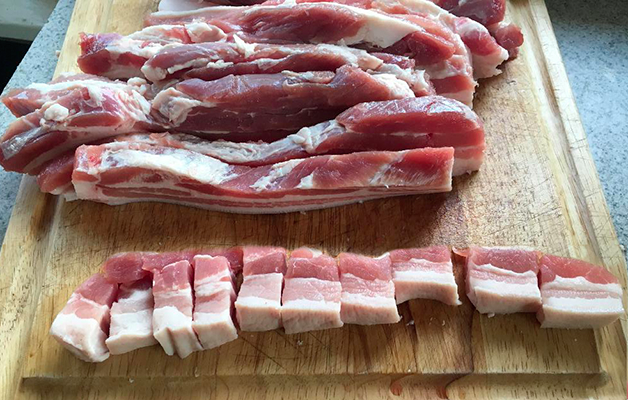 Cut the pork belly into 1” strips, then cut the strips into ¾” to 1” pieces again. 4. Heat up the oil in a medium pot at medium heat. 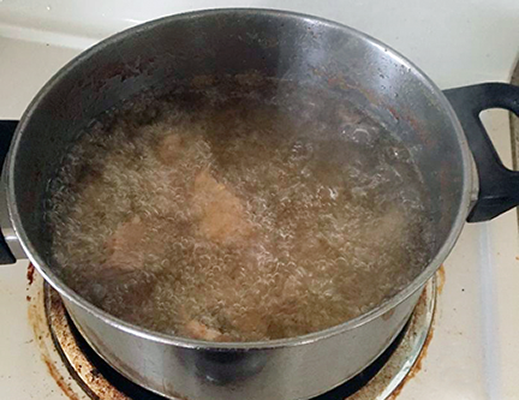 Do not overfill the pan – fill up to a third, tops. 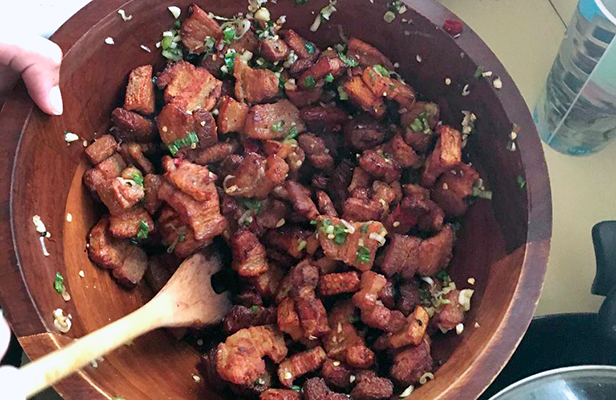 Add the pork belly in batches, about ½ to 1 lb at a time, to the hot oil. 5. Don’t put all the pork belly in at once – the oil wil start to bubble and rise in the pan. BE CAREFUL. Cook for 5-7 minutes or until light brown. Note: I experimented with oven-crisping the pork belly, but found it too finicky. The double deep fry makes sure the pork belly is crispy yet tender, and the dressing moistens the meat to the perfect texture. 6. Increase the temperature to medium high. 8. 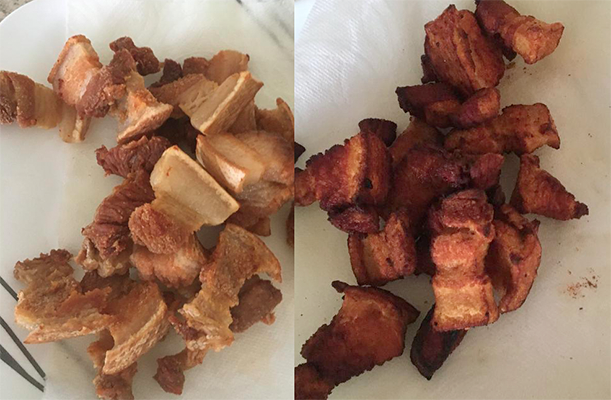 Let friend pork belly rest on a paper-towel covered plate 3-5 minutes. 9. Then, stir cooked pork into dressing. 10. Peel & slice the cucumbers thinly. Cut jalapenos in half and remove center vein & seeds. Cut julienne, then again lengthwise, to 1 ¼” matchsticks. 11. Pre-heat oven to 400 degrees; put bread on a baking sheet and warm 5 minutes, or until crispy & flaky. 12. 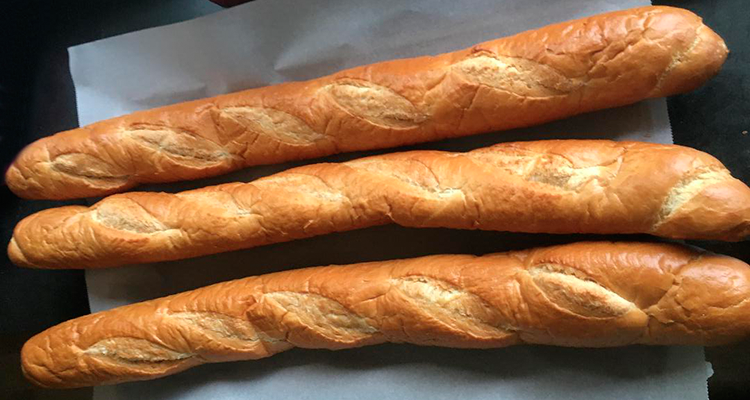 Remove baguettes and cut in half , then lengthwise. After that, the assembly is up to you! I prefer to start with mayo, sriarcha, and a dash or two of magi sauce on the bread (its strong, so ease up! 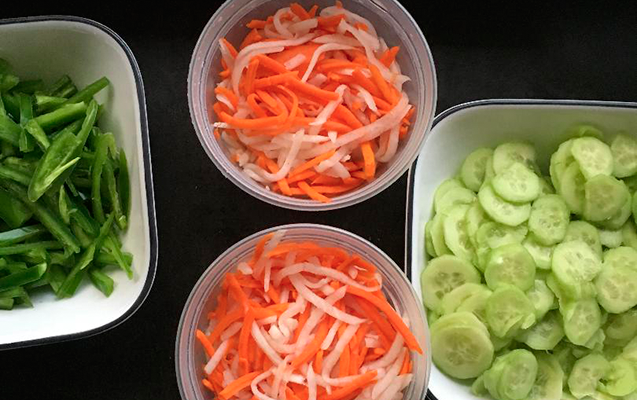 ), then add cucumbers, pickled carrot & daikon, jalapeno. 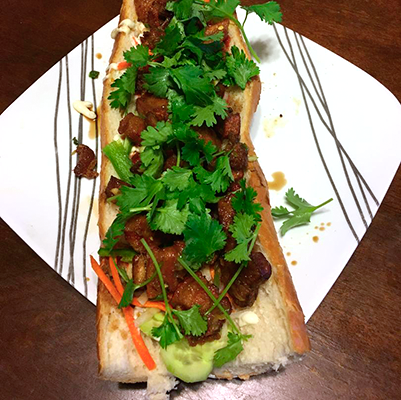 I finish with the pork belly and top with the cilantro, and sprinkle some crushed peanuts on top.